Step into a bygone age, when life was simpler — a world of haymaking, maple sugaring, and county fairs, where children dance in the fields and the first snow is heralded with joyous delight. 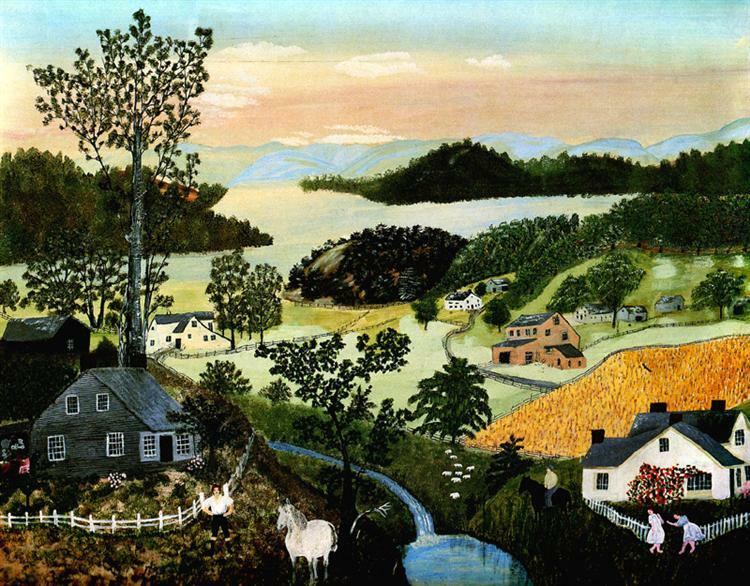 This is the world of Grandma Moses, an American folk painter famous for her paintings of old-time country life. Grandma Moses was born Anna Mary Robertson on September 7, 1860, in Greenwich, New York. As a child, her opportunities for a “formal education” were very limited, as were the funds for purchasing art supplies, but with plenty of natural interest and some encouragement from her father, she nevertheless became a self-taught painter. She learned to make her own paints out of juice from berries, grapes, and lemons, and created what she called “lambscapes” on blank pieces of newspaper her father brought home. As a married woman, her artistic talent expressed itself in her highly original ways of decorating her home. (A fireboard creation she produced when she accidentally ran out of wallpaper for the parlor is now displayed in a museum.) After her husband died and arthritis forced her to give up the farm chores, it was only natural that she turn to art for occupation. She created worsted-embroidery pictures for a time, but this, too, became difficult as her arthritis progressed, and her sister suggested that she try painting. She did, although she claimed afterward that she took it up to make a Christmas present for the postman, since it was easier than baking a cake over a hot stove. 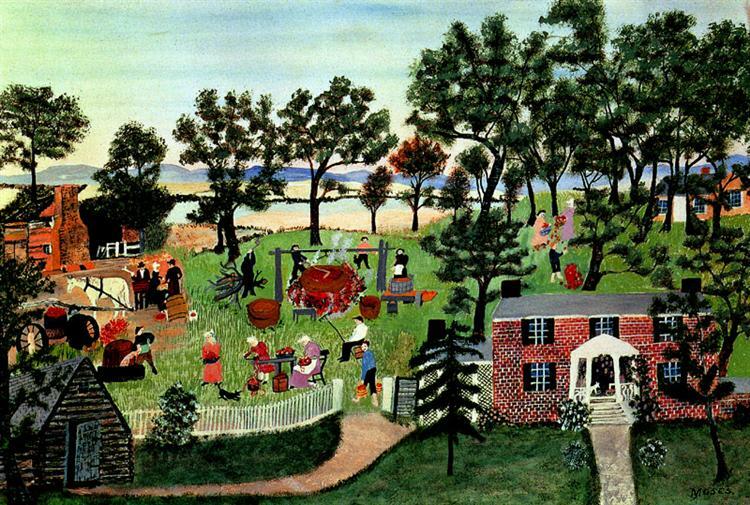 At any rate, Grandma Moses took up painting at the age of 76. At first, she mostly copied her favorite pictures from postcards, illustrated books, and Currier and Ives prints. But gradually she began to create her own works, scenes she remembered from her childhood. And here it was that she truly came into her own. She had no easel; instead, she painted on Masonite board, 24 by 30 inches or less, laid flat on the kitchen table. For a while, she would just sit and reminisce until an inspiration hit her, and then she’d paint for hours at a time, doing at least a little bit almost every day. She worked from top to bottom, starting with the sky and finishing with the people. 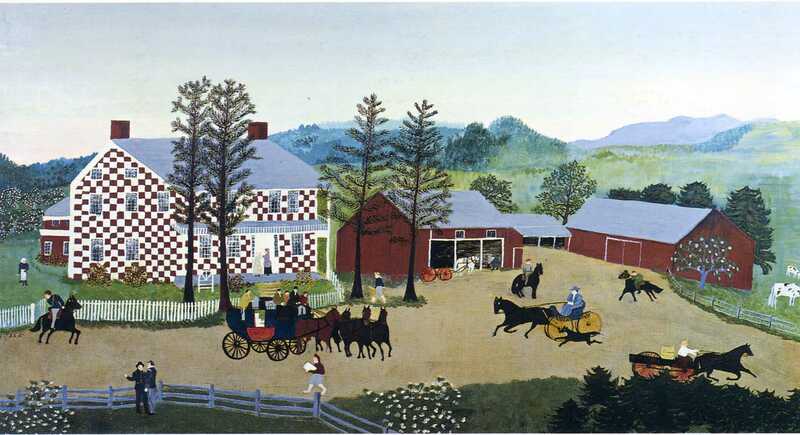 Grandma Moses’s renowned American Primitive style perfectly suited the beautiful world she was portraying. The small, one-dimensional figures are delightfully simple. Life and humor abound in every part of the scene. 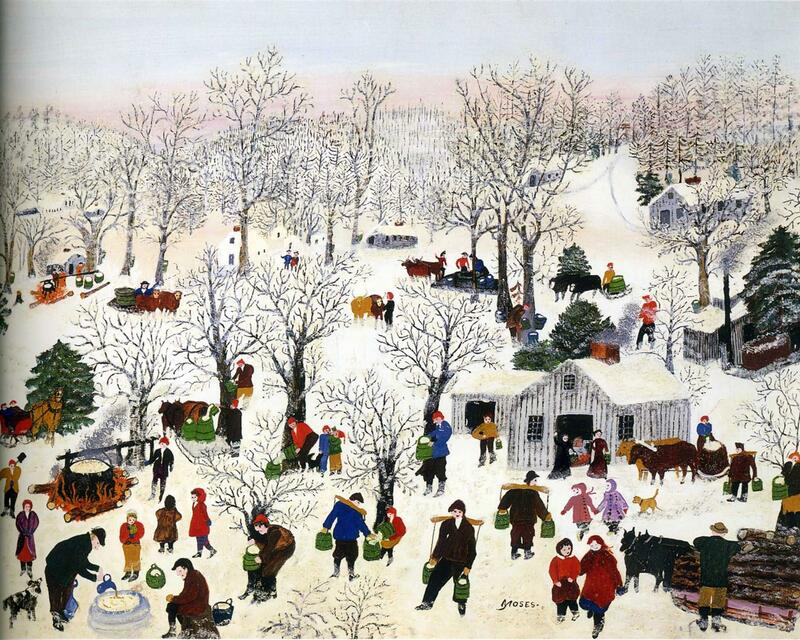 Grandma Moses was also a master of using color to capture the mood and the season. The finished work always gives a sense of nostalgia and the childlike joy of country life. A tiny lady known for her cheerfulness, keen observation, and quick wit, Grandma Moses died on December 13, 1961, at Hoosick Falls, New York, at the age of 101. She produced about 2,000 paintings in her lifetime, providing a glimpse of the good old days for generations to come. 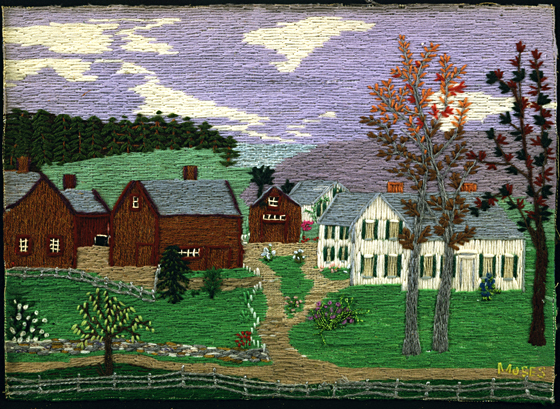 Create a timeline to appreciate all that Grandma Moses would have seen during her lifetime. You can use these simple timelines of the 1800s and 1900s for a list of events. You’ll also find resources below to help you build your timeline. Pick out a few favorite works from the gallery below to use for picture study. Give your child time to study the work — just look at the picture and enjoy it. Then turn the picture over and have him tell you what he saw. You’ll find picture study notebooking pages below. After he has studied several of the paintings, picked out his favorite, and has described it, ask him to draw the scene, or draw his own scene in a similar style. Add Grandma Moses to an artist notebook (see resources below). Obituary in the New York Times containing interesting biographical information. Interactive site to help you create your own printable timeline. Interactive jigsaw puzzle of A Beautiful World at GardenOfPraise.com. Picture to color in the Grandma Moses style at FolkArtLife.com, and two more. A coloring page for Harper’s Ferry (right-click on image to print). Our favorite Grandma Moses biography. Read our entire review, where you’ll also find selected works and notebooking pages. A new favorite. Sprinkled with pieces of Grandma Moses’s autobiography, and illustrated with her own works described by simple text. Wonderful lesson plan for learning about Grandma Moses and her paintings, and then using her style to paint landscapes (scroll to the bottom for printable download). Four different pages at NotebookingFairy.com. Simple pages for documenting an artist and works.